Heading south / east on I-275 approaching the Combs-Hehl Bridge (this name is not widely used or even known). In the distance one can see the high US 27 bridge over I-275. 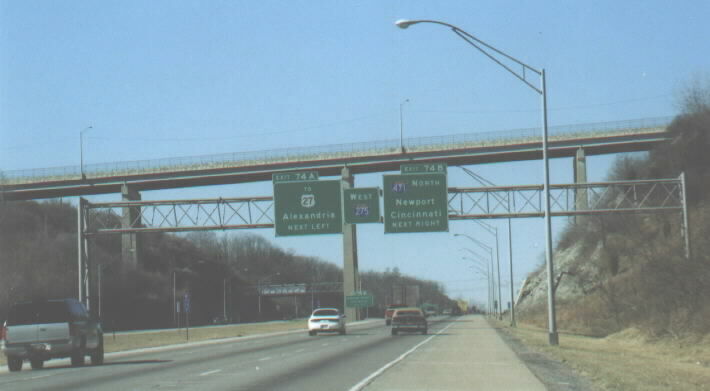 The interchange in the foreground in US 52. Nearby is Riverbend, an outdoor music venue, and Coney Island, an old amusement park that is home to the worlds largest re-circulating swimming pool. Getting closer to the bridge. In the summer of 1997 we were in this same place and on our way to Canada, towing our boat behind us. There was construction, we went over a bump, and the axel on the (probably overloaded) boat trailer broke in spectacular fashion and flew into the median! For more info on the bridge, go here. Entering Kentucky where, as the sign says, education pays. We are also entering Campbell County. Having crossed the Ohio River, we are heading up into Kentucky and towards the junction with I-471. 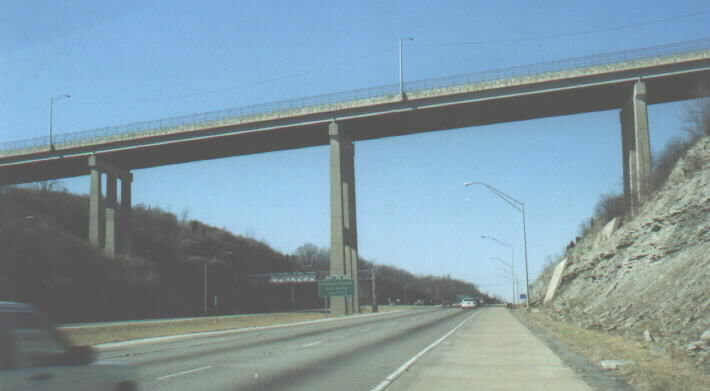 The very high bridge carries US 27 and used to be at ground level before the hill was cut out for I-275. A closer look at the bridge. Note the horizontal support on the bridge above the BGS in the median. 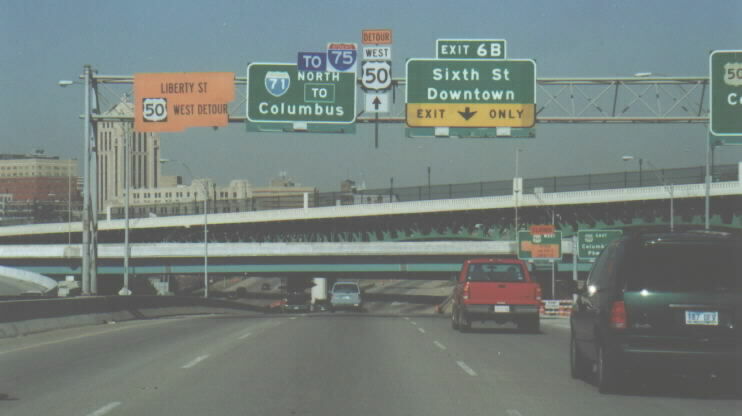 Heading north on I-471 towards downtown, in the area of the US 27 interchange. Most of I-471 is divided with a special jersey barrier that has shrubs on top of it. Crossing the Ohio River on the I-471 Big Mac Bridge. More info here. Approaching the interchange of I-471 and the eastern end of FWW. Just north of here, 471 ends into its parent. Note the temporary signage added for the construction. 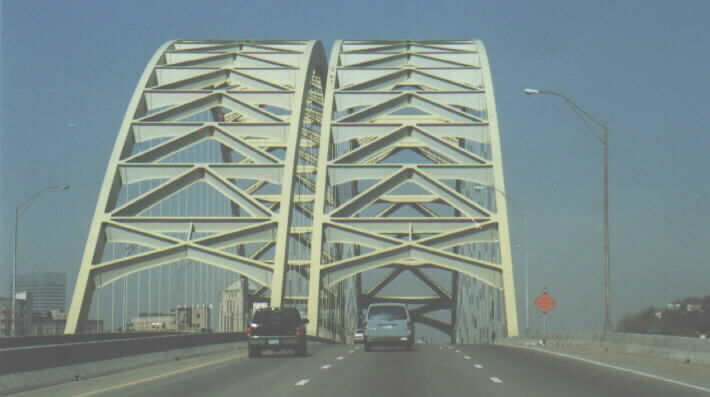 The bridges overhead carry traffic in and out of downtown, which is to the left of the photo.